New York:: Alfred A. Knopf,, 1967.. First Edition. Hardcover. Octavo, about 8.5 inches (20.5 cm) tall, in quarter white cloth on black cloth covered boards. 304 pages illustrated by drawings. SIGNED BY THE AUTHOR ON THE FRONT ENDPAPER. Lovely copy with just a very light corner bump and a little rubbing. Interior bright, unmarked, sound. Jacket is bright with just the slightest edge wear and a tiny tear to the upper front tip. 1999-02-05. New. Ships with Tracking Number! INTERNATIONAL WORLDWIDE Shipping available. Buy with confidence, excellent customer service! New York: Alfred A. Knopf, 1967. The yarns of a cowboy David Harum for those who have in their blood either a touch of larceny, or an affection for the Old West, or both. Jacket has several small chips on spine and top edge missing, not price clipped. Black cloth boards with cream cloth spine cover, lightly rubbed on edges. Author inscription on fep. There is a gift inscription on the fep reverse from another person. Pages are clean, text has no markings, binding is sound.. Inscribed By Author. First Edition. Hard Cover. Good/Good -. Illus. by Bjorklund, Lorence. 8vo - over 7¾" - 9¾" tall. New York: Alfred A. Knopf. V.G.++/V.G.+ d.j.. 1967. First Edition. HB. West, or both. .
New York: Knopf, 1967. Second Printing. Hard Cover. Inscribed by author on front endpaper. No other writing or marks. FINE IN FINE DUST JACKET WITH ORIGINAL $6.95 PRICE. Knopf. Hardcover. 039442929X New Condition. . New. Bison Books. PAPERBACK. 0803270860 New Condition. . New. Knopf. Hardcover. 039442929X New Condition *** Right Off the Shelf | Ships within 2 Business Days ~~~ Customer Service Is Our Top Priority! - Thank you for LOOKING :-) . New. 1999-02-05. Good. Ships with Tracking Number! INTERNATIONAL WORLDWIDE Shipping available. May not contain Access Codes or Supplements. May be ex-library. Shipping & Handling by region. Buy with confidence, excellent customer service! 1970, 1st edition, 7th printing, very good+, with a very good+ dust jacket, published by Alfred Knopf, New York, 304 pages. 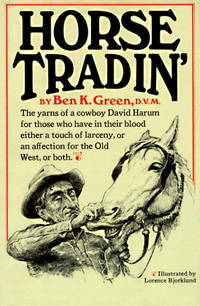 Ben Green relates the yarns of David Harum an old time Cowboy, and the tricks of the trade to make horses look better, with a touch of larceny, knavery, skill, and pure unadulterated "CON" in the trading horses. Illustrations by Lorence Bjorklund. .
Knopf Publishing Group. Very Good in Very Good- dust jacket. 1967. First Edition. Hardcover. Book is clean and tight. Corners and ends of spine are bumped and shelf worn. Author signed "To Concho you owe me, Dr. Ben K. Green" on front flyleaf. Then there are a couple of other names on same page and one on inside front cover. Bottom edges are discolored, and top edges were red at one time but now sort of purple. Dust jacket is very worn and chipped, still in one piece. ; 304 pages; Signed by Author . Bison Books. PAPERBACK. 0803270860 Like New Condition. . Fine. New York, NY: Knopf, 1967. First Edition. Hardcover. Very Good in Good DJ. Lorence Bjorklund. 304pp., old western bookplate illus. by Charle M. Russell, corners sharp, clean tight bright copy in price clipped dj with one chip at heel of spine, in mylar cover. Author's first book of stories. 50 BEST -"Knew more about horses than anyone." Native of Cumby Texas and the kind of Westerner who crawled out of the cradle and into the saddle. New York: Alfred A. Knopf, 1967. Mylar protector, third printing. Cloth. Very Good/Very Good. Illus. by Bjorklund, Lorence. 8vo - over 7¾" - 9¾" tall. Knopf. Hardcover. 039442929X Like New Condition. . Fine. Knopf. 1967. Hardcover. 9780394429298 . Signed and inscribed by author on front endpaper. Eighth printing. HC, Alfred Knopf, 1971. Ex-library book, with a mylar cover over the DJ and with the usual library markings. Spine of DJ has a library marking, and is in good condition. Corners of covers are bumped some. ; 9.13 X 6.57 X 1.11 inches; 304 pages . Knopf, 1967-05-12. First. Hardcover. Used:Good. Knopf. Hardcover. 039442929X Special order direct from the distributor . New. New York: Alfred A. Knopf, 1967. W5 - A 2nd printing hardcover book SIGNED by author on the front free endpaper in very good condition in good dust jacket that is mylar protected. Dust jacket has wrinkling, chipping, crease and tears on the edges and corners, light discoloration and shelf wear. Book has some bumped corners, some stains on the page edges, light discoloration and shelf wear. Illustrated by Lorence Bjorklund. The yarns of a cowboy David Harum for those who have in their blood either a touch of larceny, or an affection for the Old West, or both. 8.5"x6", 304 pages. Satisfaction Guaranteed.. Signed by Author. 2nd Printing. Hard Cover. Very Good/Good. 8vo - over 7¾" - 9¾" tall. Knopf. Good with no dust jacket. 1982. Later Printing. Hardcover. B001TPBN92 . New York: Alfred A. Knopf, 1969. 304pp. ; HB blk.&white; slight rub w/clean,tight pgs. DJ beige w/blk.&orange; rubbed w/spine darkened; chips&tears. "The yarns of a cowboy David Harum for those who have in their blood either a touch of larceny, or an affection for the Old West, or both." illus.. Fifth Printing. Hard Cover. Very Good +/Very Good. Illus. by Bjorklund, Lorence. 8vo - over 7¾" - 9¾" tall. Alfred A Knopf. Clean Tight And Square. No Markings With Little Shelf Wear To Jacket Edges. Now In Protective Mylar. . Very Good. Hardcover. 1967. Bison Books. PAPERBACK. 0803270860 Special order direct from the distributor . New. Paperback. New. Includes twenty tales that add up to a true account of author's experiences around the corrals, livery stables, and wagon yards of the West. This title contains tales that range from tricks to make an old horse seem young (at least until the poor creature died from the side effects of the scam) to a recipe for making a dapple-gray mule. Knopf. Hardcover. 039442929X *LIKE NEW* Ships Same Day or Next! . Fine. Knopf. Hardcover. 039442929X *BRAND NEW* Ships Same Day or Next! . New. New York: Alfred A. Knopf, 1977. Reprint. . Hardcover. VG/Good. 304 pages. Dr. Green writes of his experiences around the corrals, livery stables and wagonyards of the cattleman's West. Illustrated with drawings by Lorence Bjorklund. VG/Good. Tight binding, clean and square. Gift inscription on FEP. Dustjacket is price clipped and has chips along top edge. Dj in protective mylar sleeve. Item #: B8280. Bison Books. PAPERBACK. 0803270860 . New. Bison Books. PAPERBACK. 0803270860 Remainder mark . Fine. U S. A.: Knopf. As New/Very Good. 1985. Hardcover. 039442929x 304pp The yarns of a cowboy David Harum for those who have in their blood either a touch of larceny, or an affection for the Old West, or both Borzoi edition Dust jacket has tears on edge of jacket . Bison Books, 1999-08-01. Paperback. Good. New York: Alfred A. Knopf. G/G. 1972. Cloth. The yarns of a cowboy David Harum for those who have in their blood either a touch of larceny, or an affection for the Old West or both. 304 pp. Jacket is good, but has some chipping and small tears. one stain on the spine. Slightly cocked; 8vo . Alfred A. Knopf. Hardcover. B000GYD26O HARDBACK- Good condition. Ex-library copy with no dust jacket and minimal library markings. Pages clean and in good condition inside. . Good. New York: Alfred A. Knopf. Condition Very Good In Cream Cloth Binding, Dj Like New , Very Clean And Tight. . Very Good. Hardcover. First Edition. 1984. San Francisco: John Howell - Books, 1974. 111 pp. A catalogue of 320 discoveries and other works of importance from the 14th to the 20th Centuries. . First Edition. Wrappers. Very Good. 8vo - over 7¾" - 9¾" tall. New York: Knopf, 1969. Hard cover. Fine in very good dust jacket. Signed by previous owner. xiv, 304 p. illus. 22 cm. Includes Illustrations. Autobiographical. New York: Alfred A. Knopf, 1971. Book. Illus. by Lorence Bjorklund. Hardcover. 8th Printing.. Haedcover, (Two-color cloth), 8vo.304pp. Tight. Small nameplate front endpaper. One of A.C. Greene's "50 Best Books on Texas" Near Fine in V. Good, unclipped d/j in jacket protector..
New York: Alfred A. Knopf, 1975. Book. Illus. by Lorence Bjorklund. Hardcover. 14th Printing. Haedcover, (Two-color cloth), 8vo.304pp. Tight. Name front endpaper. One of A.C. Greene's "50 Best Books on Texas" Nice d/j with just a small edgetear front panal and tiny tear top of flap-fold, else Near Fine in V. Good, price-clipped d/j in jacket protector..
Bison Books. PAPERBACK. 0803270860 BRAND NEW, GIFT QUALITY! NOT OVERSTOCKS OR MARKED UP REMAINDERS! DIRECT FROM THE PUBLISHER!|0.75 . New. Bison Books. Very Good+; Clean, tight and attractive. Light scratch on fron cover. . (13-8).. 1999. Softcover. 7.9 X 5.3 X 0.5 inches; 304 pages . Condition: Very Good+; Clean, tight and attractive. Light scratch on fron cover. (13-8). Flemington, NJ: The Church, 1991. 135 pp. History of the church with lists of the Pastors, Elders, Deacons and members by year of reception.. First Edition. Cloth. Very Good/Issued Without Jacket. 12mo - over 6¾" - 7¾" tall. Bison Books. PAPERBACK. 0803270860 Ships promptly from Texas. . Very Good. 1999.